The first volume in the Warlock Sagas is centered on Archdomina Makeda, ruler of House Balash and her journey from childhood to taking leadership of her family's House and forces. I've always had a hard time getting my head around some the Skorne lore particularly the traditions, practices, how the different houses and castes interact with one another and how in a society that lives only for war, how they show certain emotions and if they even experience those emotions. The Skorne have some similarities with feudal Japan, following the way of the warrior, obeying duty and honor above all else. The Skorne are a people that have no gods, they believe the worship of deities makes one weak. They find strength in their people and ancestors. Only through living with strife and pain can life be worth living. Therefore the Skorne race is in a perpetual state of war; to be in peace would mean to cease to be. Larry Corriea does an amazing job of getting across to the reader what the Skorne are all about without giving a lengthy history lesson like some other books I've read. Because this a novella that you can burn through in two to three hours, the foreshadowing, the reveal of the villain, the final conflict and its resolution happens pretty quickly. That's not a bad thing, it's enjoyable and well worth the money. I read the novella, listened to the audiobook and then read though the novella while listening to the audiobook, I liked it that much. 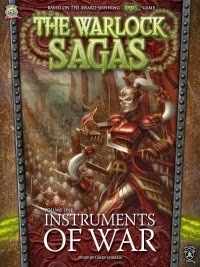 Instrument of War can be found at skullislandx, Barnes & Noble, Amazon and Audible.